Super strength formulation removes even the toughest grease and grime. Low foaming, specially designed for machines with suction driers. Ideal for cleaning large warehouses, rapid grease cutting ensures only one pass of the machine is required. Unperfumed, product will not taint in food storage areas. 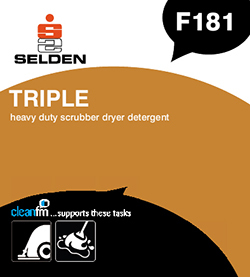 Suitable for all heavy duty scrubber drier machines and for general machine scrub applications. For heavy duty scrubbing and stripping dilute 1 part to 10 parts water. For maintenance cleaning dilute 1 part to 80 parts water. Composition An advanced blend of the latest low foaming nonionic, anionic and amphoteric surfactants, alkaline builders, water softeners and a water soluble solvent.